This page collects together all the resources for Primary Care Collaborative practices. We know your time is precious, so have arranged resources into those that can be done in 10 mins or less, those that can be covered in 30 mins, and resources that take a little longer. 25 May 2016, Bristol slides. 14 March 2017, Bath slides. 24 May 2017, Bath slides. 27 September 2017, Swindon slides and handout on action learning. Watch and share this video from Dr Dr Mike Evans on QI in healthcare. Read our Guide to Quality Improvement: a handy, A5 sized handbook, which explains what QI science is all about and how it can be used to deliver safer and better patient care. Reflect on how you have been involved in quality improvement in the last 12 months, and what areas you might like to improve in your practice in the next 6 months. Watch introduction to Quality Improvement in 4 objects — a Russian Doll, a lamp, a tally sheet, and scales and then read the supporting blog post. Start your improvement journey on our Academy website. Watch Professor Bill Lucas speak about the Habits of an Improver. Register for an account on Life. It is free to signup and use for members of the Primary Care Collaborative. Read the RCGP QI guide here with bite sized learning on plan-do-study-act approach, data sources, run charts and process mapping and register for QI ready which collects case studies on QI in general practice. Join the MOOC (massive open online course) for quality improvement in healthcare. Culture simply means ‘the way we doing things around here’. It’s a way of quantifying what it feels like to come to work. A good culture usually means that people enjoy coming to work and feel like a valued member of the team. It’s not about what you do but the way in which you do it in terms of the interactions between people in a unit, team or department. A good culture cannot be provided by leaders, although they do have a part to play. Culture is local and each member of the team needs to understand their role in supporting and contributing to a positive culture and work environment for everyone, every day. Leaders must drive the culture change by demonstrating their own commitment to safety culture and providing the resources to achieve a culture of safety. Read and share our leaflet for practices on the culture survey or display this poster in your practice. Read blog article: Breaking down our habitual silos in primary care from Dr Hein Le Roux. Read more blog articles from Hein. Hein has also produced a number of short podcasts on safety topics available from the Gloucestershire intranet. Read this blog from Suzette Woodward on helping people talk to each other in primary care. Start a conversation about culture with a colleague. If you need a guide to start the conversation check out Tools to Talk video and Just Ask Me from Sign Up to Safety. Read blog article: Why don’t we talk about safety? Diary of a patient safety champion in primary care. Complete the patient safety in general practice checklist from Wessex AHSN. Watch “Safety Differently: the Movie” a 30 minute documentary telling the story of three organisations that changed their safety culture. Read Safer Healthcare: Strategies for the Real World — this is a free e-book from Professor Charles Vincent and Dr René Amalberti. Read RCGP toolkit on patient safety in general practice. Use EUROCONTROL Safety Culture discussion cards in conversation with your team. Watch and share this video from NHS Improvement on the National Patient Safety Alerting System. Read the work of the Primary Care Patient Safety (PISA) Research Group at Cardiff University, for example this journal article. Watch this 4 minute video on systems thinking for incident investigation. Read our guide on Learning to be Safer, which covers incident reporting, significant event analysis and human factors in primary care. Reflect on the last incident you were involved in. How was it reported, investigated and the learning shared? Try using the Yorkshire Contributory Factors checklist for incident investigation to identify some contributory factors. Read about Learning from excellence — an approach developed based on appreciative inquiry to look at where things go right. Read their quick start up guide, watch videos explaining the approach and access other resources at their website. Read the book Black Box Thinking by Matthew Syed or watch his talk. Read the Yorkshire Contributory Factors framework and associated training on carrying out a significant event audit in primary care. Try out the Wessex AHSN Safer Practice Framework. The Safer Practice Framework is a self-assessment tool that can assist General Practice teams to focus on patient safety and quality improvement activity, to deliver safer quality care. Take a break! Go for a short walk outside or to get a cup of tea with a colleague. Watch this 2 minute video from Dr Mike Evans on “What can you do to get through a crap week?”. Take a quiz! Take this short resilience test and find out resilient you are. Read this article on how burnout impacts on safety. Print out and put up one of these posters from #takewhatyouneed or the Compliment Project. Or one of the images from Sonia Sparkles, e.g. 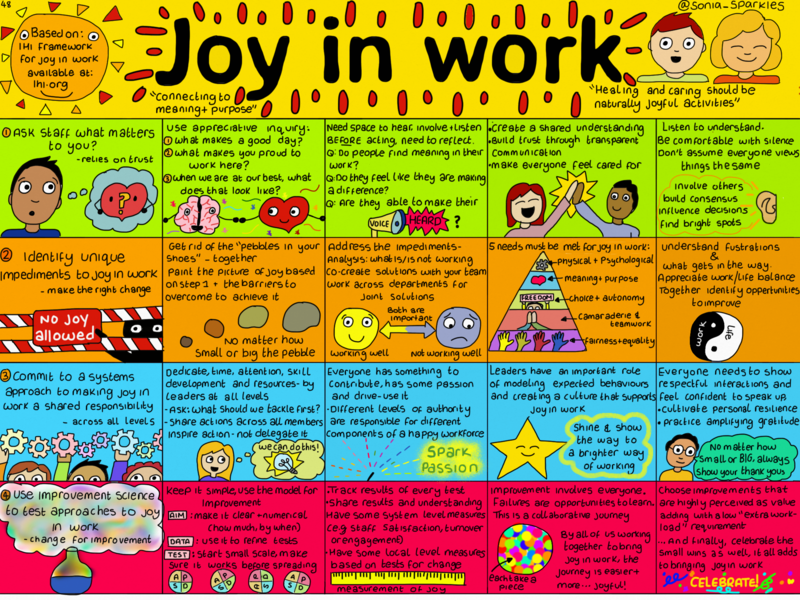 Joy at Work. Watch this animation which shows the Circle of Care – a framework to help healthcare professionals think about, practice and demonstrate high quality compassionate healthcare. This framework re-envisions compassionate healthcare by placing it in a broad social and interpersonal context, describing a multi-directional flow of care between healthcare professionals and their colleagues, patients and carers. Crucially, healthcare professionals must also care for themselves. Circle of Care was created as a result of a collaboration between the Simulation and Interactive Learning Centre (SaIL) at Guy’s and St Thomas’ NHS Foundation Trust (GSTT), and Clod Ensemble’s Performing Medicine programme. Read about the connection between work-life balance and safety in this article by James Reason: three buckets model. Watch Dr Neil Spenceley’s talk on civility in the workplace and visit www.civilitysaveslives.com for infographics to share with your team. Reflect on the NICE guidelines on workplace health and walking and cycling. Are there any you could implement in your practice? Read this “Burning the bridge to burnout” blog post for ideas. Read guidance on preventing and managing stress at work from NHS Employers. Start a campaign for Health at Work using resources from the British Heart Foundation. Useful resources to support staff’s mental health at work is available from MIND. Some NHS organisations have their own singing groups and choirs — watch our video Help! which shows the Sirona choir in action. HALT: take a break — check out the resources from Guy’s and St Thomas’s HALT: take a break campaign for better breaks and sleep. Visit NHS networks forum and try out some of their techniques on how staff in primary care can improve their personal productivity including resilience, computer confidence, touch-typing and speed-reading developed for practices visit NHS networks forum on personal productivity. Register for the General Practice Workforce Analysis Tool on the Models of Care portal. Read the book How to Have a Good Day by Caroline Webb. Take a personality test — what is your role in the team? Take the free quiz here. Read a one-page guide from the Sheffield Microsystems Coaching Academy. Share the results from your personality test with a colleague — ask them to complete the test too and discuss your findings. Assess your team as a clinical microsystem using the 5 Ps. Watch this short video on How to Huddle. Safety huddles are part a of systematic approach to reducing harm. Find out more. Some practices have been using safety huddles in primary care. Discuss in your team what are your shared team goals and values? This list of values may help you in discussions. Discuss and test out a way to introduce a safety huddle or tea-time team chat in your practice. Say thank you to a member of your team who has helped you today. Print some Kudos cards — these are free-to-download cards that you can use for thanking and praising people in your team. Reflect on how you share praise within your team. How do you pass on positive feedback from patients? How could you improve this? Read the Coaching Manual by Julie Starr or Radical Candour by Kim Scott. Watch and share our video on improving communication using SBAR (situation – background – assessment – recommendation). Watch Doctor Knows Best from Who’s Leg is it Anyway? and reflect on the questions in the training resource. Watch Empathy: the Human Connection to Healthcare from Cleveland Clinic at a team meeting and discuss with colleagues. Reflect on ways to improve communication within your team. You may want to discuss with a colleague or at a team meeting. One technique we have found helpful for these discussions is called TRIZ. Read about human factors. Communication, teamwork, and resilience are some human factors which can affect safety. The environment in which individuals and teams work, as well as aspects of the task itself can also have an impact. Human Factors in Healthcare: Common Terms published by the Clinical Human Factors Group is a great introduction to some of the terms used in this field. Read Human Factors in Healthcare by Debbie Rosenorn-Lanng — available in two parts (Level 1 and Level 2). Ask a member of the AHSN team to present our human factors awareness session at a practice meeting. Share a useful resource you have found with us to add to this page. Share a resource you have found helpful with a colleague. Plan the first steps of you own safety improvement project in the practice and invite other members of the team to join you. Look at other learning opportunities, for example the Q Community. Discuss with colleagues how you can involve patients in your safety and improvement activities. Read our toolkit on ways to work together with patients and the public. Watch this video about the project a practice in Gloucestershire undertook around involving carers.